It's Friday and it's time for 'A Bunch for the Weekend' - we all look forward to the weekend and want to make it feel special. A bunch of colourful as well as beautiful flowers will bring life to a space and create a warm and welcoming feeling. 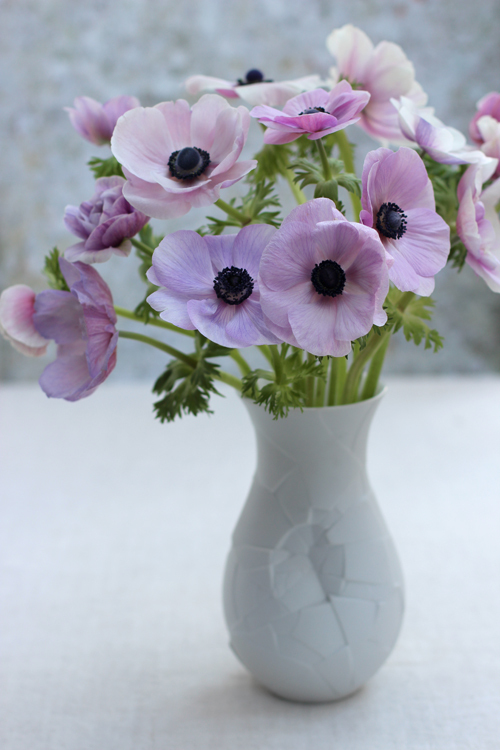 "It's always a pleasure and lots of fun to buy a bunch of flowers for the weekend and in this series of blog posts, called 'A Bunch for the Weekend', I will show you how you can make quick and easy flower arrangements for your home. Buy the flowers wherever it's convenient, easy and most affordable for you whether that is from a flower stall, farmers' market, the supermarket or a florist. 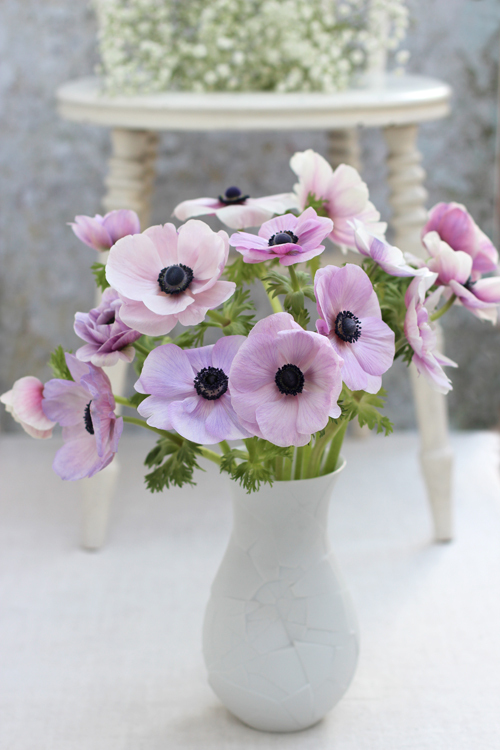 When you buy Anemones avoid selecting flowers that have dark pollen powder on the petals. They will not last as long. Also look at the stems and make sure they are not broken or squased and you also don't want to buy flowers where the bottom of the stems are curling back. 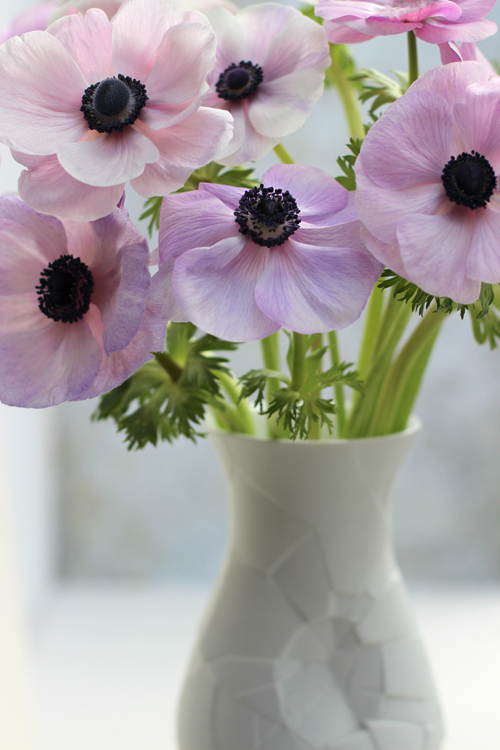 Anemones are one of those rare flowers that continues to grow in the vase. Tulips are another one. If you don't want the stems to curve and bend - one little trick is to put an elastic band at the top and bottom of the stems and leave the flowers over night. It will help to initially keep the stems straight while making the arrangement - after that they will still reach for the light! 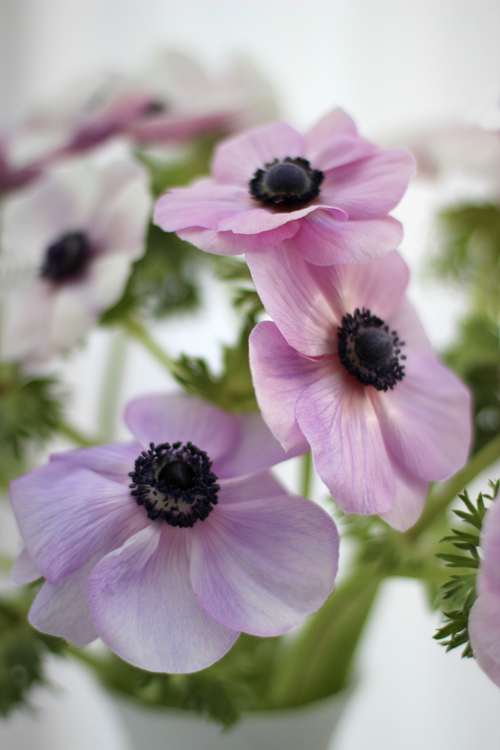 Anemones has an attractive 'ruff' of foliage towards the top. The higher up it sits the fresher the flower. 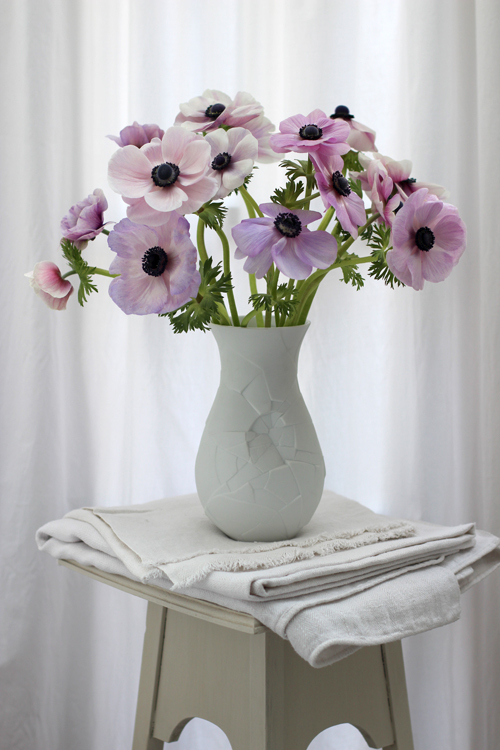 Leave plenty of space for the flowers in the vase - in other words don't crowd them - and use a vase that supports the stems. 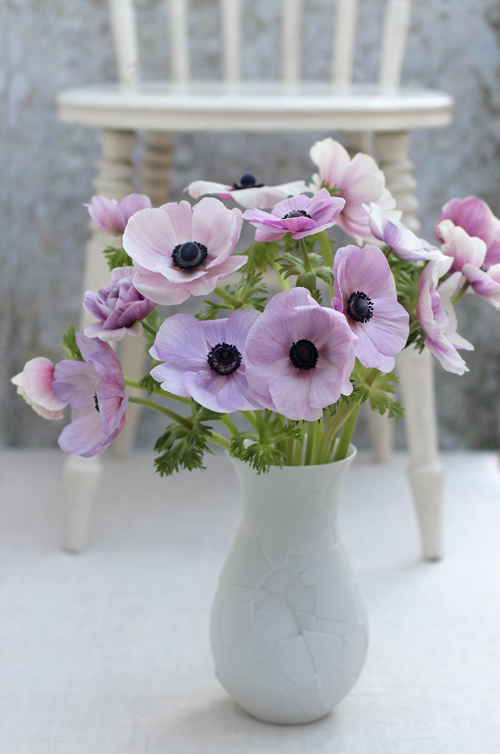 With their sooty-eyed centre Anemones a magnificent on their own - but mixing light and dark colours of Anemones never looks wrong! Thank you for visiting 'Of Spring and Summer' - I will be here on Sunday morning - with another floral quote by someone passionate about flowers. P. S. If you are looking for more floral inspiration you can go over and have a look at my Pinterest boards. I now have just over 12 400 followers and around 200 boards all relating to flowers, flower styling and flower arranging. There are boards on individual flowers and boards showing how to arrange flowers. Other boards show different ways of using vases and containers. Simply click on the link below and it will take you straight there.